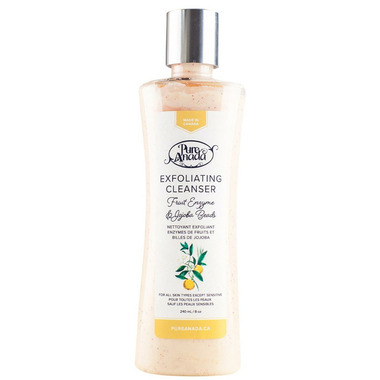 Jojoba beads and fruit enzymes gently exfoliate skin cells to renew and brighten your complexion. This cleanser is naturally scented and colored with real fruit extracts! Yummy. Suggested Use: Apply a thin layer to your skin and wipe clean with a damp cloth. Gentle enough to use daily. Suggested frequency: at least once a week. Great product! I love that it has natural ingredients and isn't tested on animals. Not only that, but it's perfect for my combination skin. I am addicted to Pure Anada products! I started using the Awake Gel, this cleanser and their moisturizers at the same time and the difference it has made in my skin is AMAZING. I wish I would have taken before and after pictures. I love the smell! The price is worth it! I love this. It has such a creamy texture and leaves my skin feeling very soft. I struggle with very dry skin, and I have found a big improvement since switching to this cleanser. Plus it smells fantastic! This exfoliating cleanser really is amazing. I use Retin-A for acne (something I never thought I would be dealing with at 42) so my skin tends now to get quite dry with patches of flaking skin. Iâ€™m not a huge fan of aggressive scrubs so I thought Iâ€™d give this a try (I am always skeptical of a productâ€™s claims). Wow, has it ever improved my skin! It went from rough, dry and flaking to the most perfect my skin has ever been. I would gladly give this cleanser 10 stars for itâ€™s performance but I did remove one star because I thruthfully think the price is too high. I will be repurchasing for sure, but only when itâ€™s on sale. Highly recommend!! Love this stuff! Smells great, ingredients I am not afraid of, and it makes my skin feel amazing. Love every new product I try from Pure Anada. This cleanser has a great scent and exfoliates well! My skin feels great!